People are familiar with the medical disease of stroke. It is also known by its diagnostic name Cerebral Vascular Accident (CVA). What many people do not know is that stroke can occur in the spinal cord as well as in the brain. A person can have a stroke in the spinal cord which can result in a spinal cord injury.In addition, a cause of stoke in the brain can be from a severe episode of autonomic dysreflexia if you have a spinal cord injury typically above the T6 level. You are at risk of a stroke in the brain if your blood pressure becomes too high during an AD episode. Stroke in the brain or spinal cord occurs in one of two ways. Either a blood clot or emboli prevents blood from flowing through the brain or spinal cord. Without the constant flow of blood containing oxygen and nutrients, the affected area is denied the life sustaining substances needed to keep the area beyond the clot viable. The other source of stroke is hemorrhage where the blood vessel bursts allowing blood to flow throughout the tissue causing damage by pressure as well as lack of oxygen and nutrients to the area. The outcomes of a stroke in the spinal cord are different from a stroke in the brain. When a stroke occurs in the brain, there are usually some cognitive or thinking deficits that can be short or long term. 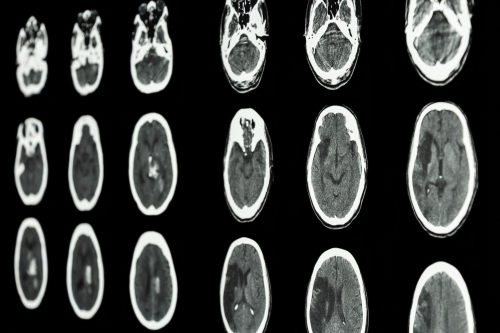 Consequences of a stroke in the brain can include visual, spacial, speaking, swallowing and thinking issues. A stroke in the brain can lead to functional impairment on one side of the body called hemiplegia. A stroke in the spinal cord can have functional movement and sensory changes at the spinal cord level of the stroke. The result is the same as other spinal cord injuries where messages from the brain cannot travel to and from the brain. Some people are at higher risk for a stroke in the central nervous system. Risk factors include atherosclerosis (hardening of the arteries), high blood pressure, high cholesterol, heart disease, obesity, diabetes, smoking, high alcohol intake, and lack of exercise. There are medical procedures that can put you at risk for a stroke such as heart bypass surgery (from being on the bypass machine), open abdominal aortic aneurism (also bypass machine), spinal surgery, or a clot in the spinal arteries. All of these can lead to ischemia (lack of blood flow) from blood clots or hemorrhage into the spinal cord. There is another risk factor that people will not know they have until a problem has occurred. This is atrial-venous malformation (AVM). AVM can occur anywhere in the body. It is an error in the connection where an artery turns into a vein. One connection is a very tiny area, but locations of the atrial venous connections are throughout the body. When a malformation is present, the risk of blood clot or hemorrhage is greatly increased. If this is in some parts of your body, you might not ever know it is there but if this is in the central nervous system, significant issues can arise as a result. Some people will have an unrelated problem when an AVM is discovered through imaging. Correction can occur before a problem arises. Most individuals will not know of the presence of the AVM until consequences occur. A stroke in the brain or spinal cord is very significant as both are housed in bones. The brain is encased in the skull for protection. The spinal cord is surrounded by multiple vertebrae. Bone does not expand. The skull and vertebrae do not allow room for anything except nervous tissue, blood vessels and cerebral spinal fluid. There is no room for extra bulk such as blood from hemorrhage or clots. Hemorrhage puts pressure on surrounding tissue which collapses because the bone cannot expand to accommodate the increased load. Clots take up space as well and do not allow blood to pass to feed the nervous tissue. Another time stoke can occur is after a person already has a spinal cord injury from any cause, medical or trauma. Another group that is affected are individuals who have autonomic nerve system disfunction without spinal cord injury. Anyone can sustain a stroke at any time, if they have a spinal cord injury or not. But some of the risk factors; high cholesterol, heart disease, obesity, diabetes, and lack of exercise; occur more often in individuals with spinal cord injury. Another risk factor for spinal cord stroke is autonomic dysreflexia (AD). AD is particular to individuals with cervical and thoracic injury. This highest risk group is for individuals with spinal cord at T6 or above. However, recent research indicates individuals with injury at any level in the cervical or thoracic regions of the spinal cord can have episodes of AD. AD is a misinterpretation of signals to and from the brain. Typically, something annoying the body below the level of injury will send a signal to the brain which gets interrupted at the site of the spinal cord injury. The message is unable to be interpreted by the brain, so in response, the brain will attempt to fix the problem by a release of the autonomic nervous system. The autonomic nervous system controls all body activity that occurs without your thinking about it such as breathing, your heart beating, your internal organs working or anything that happens in your body automatically. Symptoms of AD above the level of injury are a 20-40mm Hg (points) increase in your normal top number blood pressure, a faster or slower heartbeat, a pounding headache, apprehension, changes in vision, nasal congestion, sweating, flushing, goosebumps, or tingling. Below the level of injury, symptoms can include nausea, chills without fever, clammy, cool or pale skin. It is important to note that a person can have one, a few or all the symptoms with AD. Also, the symptoms might be strong or vague. There have even been reported cases of silent AD where the blood pressure rises without any symptoms at all. Stroke is very serious with possible long-lasting complications. If you have warning signs of stroke, call 911. Immediate attention is necessary. Treatment for stroke caused by a blood clot in the brain is provided with tPA (tissue-type plasminogen activator,) sometimes called clot buster medication. However, tPA it is only effective if given within hours of the onset of the stoke. Hemorrhage types of stoke may be treated with surgery to stop the bleeding or waiting for the blood to be reabsorbed by the body. tPA has only been tested in spinal stoke in very small subject numbers with varying results. Prevention of a stoke can be difficult but if you have a spinal cord injury, there are actions you can take. Inactivity is one of the biggest risk factors for individuals with SCI. This is because blood tends to pool in your body as movement is one of the body functions that helps with circulation. Poor circulation can lead to the formation of blood clots. Moving your extremities several times a day either by yourself or by someone else will provide a boost to your circulation. Keeping constrictions away from your extremities also helps, uncrossing your legs, not ‘hooking’ your arm around your wheel chair, avoiding tight clothes, shoes, leg bag straps, etc. Stop smoking. There are successful programs that are covered by your payor to help you stop smoking. It is hard. However, with use of medications and/or therapy, it is possible. Eat a healthy diet, obesity, high cholesterol, heart disease and diabetes are common consequences of spinal cord injury. Start now to manage your dietary intake to avoid these complications. Use a meal planning assistance program to organize what you will eat and drink. There is a free meal planning service online using the government website: myplate, however, there are many apps that are also effective.Take prescribed medications if you have high cholesterol, heart disease or diabetes to keep these conditions under control. Add exercise as noted above. If you have AD, notice your symptoms. Do not brush them off if they are mild. Know your usual, average blood pressure so you will recognize when it is elevated. The blood pressure of an individual with SCI is typically lower than the general population so high blood pressure for you might be normal for others. Take advantage of the orthostatic hypotension (low blood pressure with sudden head elevation) that comes with SCI. If you have an AD episode, sit bolt upright immediately to drop your blood pressure. Relieve the irritant causing your AD episode. Call 911 if necessary. Speak with your healthcare provider about treatments for AD if you have multiple recurrences. Refer to the Reeve Foundation wallet card for more AD information. Being aware of the possibility of a stoke and taking a preventative stance against it is your first line of defense. Most individuals with SCI will not have a stroke but know the warning signs so you can take immediate action. People don’t often think of stoke in the young population. Unfortunately, stoke is appearing more often in young people, even infants. Stroke is associated with these pediatric conditions: blood vessel malformations including AVM, vasculitis, clotting disorders, meningitis and other infections, sickle cell disease, heart surgery, and umbilical catheterization. Setting the stage for life long health is a key to prevention. Starting early and sticking with a healthy diet, as well as adding activity at an early age are great lifelong habits. These are things all parents do. Keeping up with providing a healthy lifestyle for your child and by your own example will serve your child throughout their life. I'm online in the Reeve Connect community every Wednesday from 8-9 PM ET to answer your SCI and paralysis related questions.